Women's World Cup: Who is in England's squad for Canada? England boss Mark Sampson has named his 23-strong squad for the Women's World Cup. Under former coach Hope Powell, England crashed out of Euro 2013 at the group stage without winning a game. During a 100% qualifying campaign, Sampson has brought in several old faces and some new recruits, and has chosen a squad to navigate out of a group including France, Mexico and Colombia. England play their opening game in Canada - against France - on 9 June, three days after the tournament starts. With the help of former England internationals Kelly Smith, Faye White, Sue Smith and Rachel Brown-Finnis, BBC Sport analyses the strengths of the players heading to Canada. Former England goalkeeper Rachel Brown-Finnis: "Karen's not had a lot of game time after recently being banned for fighting with an opponent and getting injured but is likely to be England's number one for the opening game against France. She has made errors in England's opening games for the past two major tournaments, but she will have put them well behind her and will want to prove herself as one of the best in the world." Did you know? Born and raised in California to English parents, she moved to Lincoln Ladies in 2011 and joined Manchester City in 2013. Brown-Finnis: "She's certainly got ambitions to start for England but has maybe slipped down the pecking order after losing her place in the Arsenal team and picking up an injury. After featuring in the Cyprus Cup in March and in the last friendly against China, she would have been hoping to kick on and play part in the World Cup but that could depend more on others." Did you know? Chamberlain not only shares the same name as Arsenal men's winger Alex Oxlade-Chamberlain, they were also both born on 15 August. Brown-Finnis: "You could easily make a case for Carly starting as England's number one. She's injury-free, bang in form and was named in the PFA team of the year after her superb displays for Notts County. Perhaps she doesn't have as much experience at international level but, on current form, she cannot be doing any more to influence Mark Sampson's thinking." Did you know? Telford first played in goal after turning up to a trial in a Sunderland goalkeeper's top that her mum bought her. Despite playing outfield, the coach assumed she was a keeper and she has stuck to that position ever since. Former England captain Faye White: "It will be her first major tournament as captain so it will be a big role to fill. There are a lot more demands on you as skipper at a World Cup. The fact she is coming back injury will be hard for her but I'm sure she will be able to handle it as she's a strong character and one of our best centre-halves." Did you know? Houghton scored in all three of Great Britain's group matches in the London Olympics, finishing as the team's top scorer despite playing in defence. White: "She has more competition at right-back now Lucy Bronze has played there for England and it is great to have cover. She is one of the few across the backline with major tournament experience and has shown she can cope with some of the best players in the world." Did you know? Scott is known as the team DJ, often organising the music in the dressing room before kick-off. White: "Lucy has adapted to international football well and, even though she prefers the full-back role, she will probably be seen by Mark Sampson as a centre-half in this tournament. She has been out with a knee injury but she has come back from serious problems before so has the resilience to match her consistency." Did you know? Bronze had never seen a match at Wembley, let alone played one, before she featured in England's defeat by Germany last November in front of record crowd. White: "Has the flexibility to play at centre-back or left-back but, for me, the former is her best position as she can be exposed out wide. She is young so still learning in an international shirt and the World Cup will be great experience for her." Did you know? Greenwood joined Everton as an eight-year old and ended her 13-year association with the team by joining Notts County last January. White: "Claire played in the 2011 World Cup but has suffered two serious knee injuries since. She hasn't played many times for England as a result but her greater experience should see her make the squad and she will be favourite to start in the left-back position." Did you know? Rafferty combines playing football at Chelsea with working as an analyst at Deutsche Bank in the City. White: "Pace might not be one of Laura's strengths but she is a great professional and has major tournament experience. She is great for the squad: very determined and a chatty character to pick the team up. She will probably be reserve behind Steph Houghton and Lucy Bronze." Did you know? Bassett is renowned for keeping her team-mates on their toes by being the squad's quiz master. White: "She won't be starting many games but her experience and her ability will shine through at a tournament like this. Being selected in the PFA team of the year shows the players still rate her and her reading of the game is a big asset. She is a great player to have alongside you at centre-back, as I know." Did you know? Stoney publicly came out as gay last year and has recently had twins with partner, former Lincoln Ladies team-mate Megan Harris. Former England winger Sue Smith: "I know she's been struggling a little bit with injuries but she's a quality player. Jordan is someone who's come into her own over the past year. She's always had potential but now she's starting to live up to it. Good with the ball at her feet and can make things happen." Did you know? Nobbs is the daughter of former Hartlepool player Keith Nobbs, who played for the north-east side in the 1980s. Sue Smith: "She's got the experience and the quality. She's been there and done it. I think she plays well as a deeper-lying midfielder in the formation that Mark wants to play. She can get the ball and spread it out wide so Fara would be the first name on the teamsheet for me." Did you know? Williams was homeless for six years while playing for England and kept it secret from her team-mates. She is now England's record cap holder. Sue Smith: "I know Jill has been suspended for the past three Manchester City games for headbutting an opponent but she's still played lots of football at her club this season so I don't think it'll affect her at all. She just offers something different with her height and athleticism. She's been playing particularly well over the past two seasons." Did you know? Had to choose between being a long-distance runner or a footballer when she was young. Sue Smith: "She was out of the squad for a few years but now she's back and playing really well for Chelsea. I think she gives a bit of strength in there, a bit of doggedness. Sometimes you need that competitiveness in midfield. She could be that one that sits in front of the defence and makes it difficult." Did you know? Back in the England reckoning after a four-year absence after claiming she was told she could not have time off to look after her children. Sue Smith: "Another player who has done well to get back in the England squad. A player that has gone continually and consistently about her business. She's got the vision that Fara Williams has but is left-footed. Mark's played her in a few games and she gives you something different from the others." Did you know? Potter's recall to the England squad comes after a seven-year absence. She is also is an FA skills coach. Sue Smith: "She gets stuck in, gives 100% all of the time and works really hard on her fitness. You need that when you're playing against the likes of Germany and France, who've got good technical players. You need someone who's going to close them down really quickly and stop them playing and that's what she can do. She's got that pace and work ethic that some of the other midfielders don't have." Did you know? In addition to playing football, Moore owns her own sports therapy business. Sue Smith: "She's suffered from injuries this year and that's my only concern with Karen, but we know what she can do. She's got that experience and been to a lot of major tournaments. She's got the ability to change a game, like Kelly Smith was able to." Did you know? Earlier this year, Carney became the first women's footballer to be inducted into Birmingham City's Hall of Fame. Former England forward Kelly Smith: "She is a very intelligent player, her runs are very clever and if she can be picked out, then she is lethal. She is a proven goalscorer in and around the box. She's benefited from the confidence Mark Sampson has instilled in her and I think now is the time for her to shine on the world stage." Did you know? Taylor is one of most well-travelled players in the squad, having represented clubs in Boston, Ottawa, Los Angeles, Melbourne, Sydney and Gothenburg. She scored a hat-trick in her fifth England game. Kelly Smith: "Mark Sampson has shown great faith in her since he's been in the role. She's a big player and personality in the squad, she's fun to be around and good for morale. It's difficult to know if she will start but she needs a quicker player to play around her, so she can turn and play a through-ball in behind the opposition defence. Playing in a World Cup will be her dream." Did you know? Another player back in the reckoning after Sampson took over from Powell. Sanderson quit the team in 2010 because of a fall-out with the former England boss. Kelly Smith: "Eni hasn't started the past couple of England games, but that might be an indication that Mark knows what she brings to the team. Her pace is always a threat and makes opposition defences drop deeper, thereby creating space in midfield. She has also shown she can score goals in major tournaments and this will be her third World Cup." Did you know? Aluko qualified as a sports and entertainment lawyer last year, and intends to represent players when she retires. Kelly Smith: "She has dominated Women's Super League 2, scoring freely and taking on three or four players at a time but international football is almost a different game. You have less time and space and you have to use your physical presence a lot more. Fran will go into the World Cup quite unknown so that could be to her advantage, but playing such competitive games in such a short space of time might also be a struggle. She has great potential and I like to watch her play." Did you know? Kirby quit playing football four years ago after suffering from depression following the death of her mother. Kelly Smith: "An early-season knee injury hasn't helped her prospects with Jodie Taylor and Fran Kirby having started to make their mark. But the timing of her return has been good and she showed her goal prowess at Euro 2013. She probably needs a bit more game time to improve her sharpness." Did you know? Duggan scored the Women's Super League's goal of the season in 2014 with a stunning volley against Chelsea, which helped deny the London team the league title. Kelly Smith: "She hasn't played any sustained international football for a long while because of a knee injury, but she has energy and enthusiasm. She has been hard to ignore because she has been scoring goals for Notts County this season and she has worked extremely hard to get back in the reckoning. Ellen has the experience of playing and scoring at the 2011 World Cup and she's a good team-mate to have around. " Did you know? White was the scorer of a famous free-kick for Notts County which became an internet sensation. 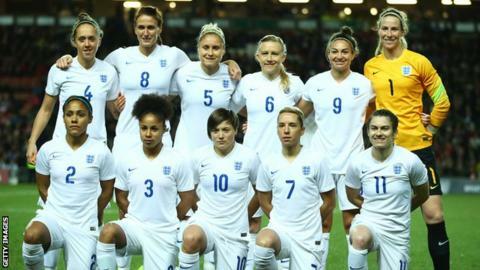 Find out how to watch the 2015 Women's World Cup on the BBC.